British Cycling has today confirmed the squad of riders who will represent the Great Britain Cycling Team at the UCI Track Cycling World Championships presented by Tissot which take place from 12 – 16 April in Hong Kong. Olympic champions Katie Archibald, Elinor Barker, Steven Burke and Callum Skinner have been named on the squad of twenty riders, of which ten are making their world championship debut. Head coach Iain Dyer said: “The team is made up of a good mix of experienced and developing riders across all the disciplines. Throughout the earlier world cups and at the UEC European Track Championships last year, there was a good opportunity to bring some new riders into the front line. They gave a really good account of themselves and that’s reflected in the selections we’ve made today. I’m looking forward to seeing them step up into world championship level competition. 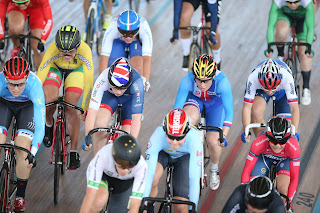 “I’m pleased to see non-programme riders Neah Evans and Lewis Oliva in Great Britain colours and their selection is testament not only to their hard work but to the support we receive from Scottish and Welsh Cycling respectively.